From the Bolivian border to the Beagle Channel, from the Andes along the Chilean frontier to the Atlantic Ocean, I have seen red flags fluttering at the side of roads. What are these small shrines so boldly decorated? I am told they are to Gauchito Gil. My curiosity finally piqued me like a tábano horsefly. I began to search for his history, his mark in the Argentine consciousness. Gauchito Gil was born in the 1840s in Pay Ubre, approximately eight kilometers (5 miles) from Mercedes, in Argentina’s Corrientes Province. His given name was Antonio Mamerto Gil Núñez. He was of the gaucho peon class, working on a large estancia (ranch) as his father had done. He was assassinated 8 January 1878. During his life, it is said, he was recognized for his healing abilities and known as a devoteé of San La Muerte. The most common tale is that to escape the love triangle and accusations of robbery (by, of course, his love rival), Gauchito Gil fled to join the army in the War of the Triple Alliance (1864-1870) against Paraguay. He returned a hero, but immediately was drafted into the civil wars (1814-1880) raging through the region. He went AWOL and was later captured and executed as a deserter. The third variation paints Gauchito Gil as a Robin Hood, stealing from the wealthy land-holding class who sponsored the civil war, to give to the poor of the region who were suffering from the inter-rich fighting. Upon being captured, Gauchito Gil declared his innocence and said the letter with his pardon was on the way. Of course, his jailer did not believe him. Gauchito Gil also warned his captor that upon returning to Mercedes, he would find his son was dying. 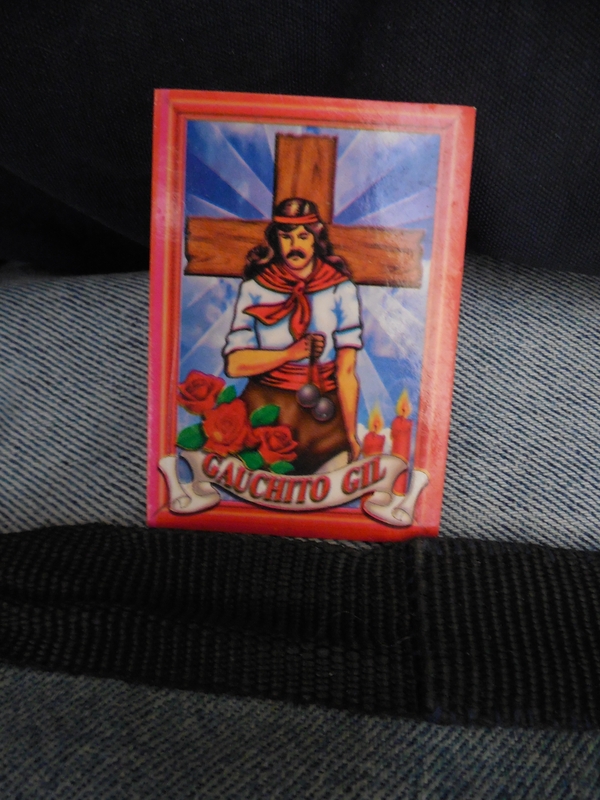 If the jailer prayed to Gauchito Gil, the son would be cured. It happened exactly as Gauchito Gil foretold. The jailer prayed to the renegade gaucho, and his son was cured. To honor the saint and pay for his crime of murdering an innocent man, the executioner walked to Pay Ubre with a large wooden cross. He erected it at the site of the murder. And the rest is history. 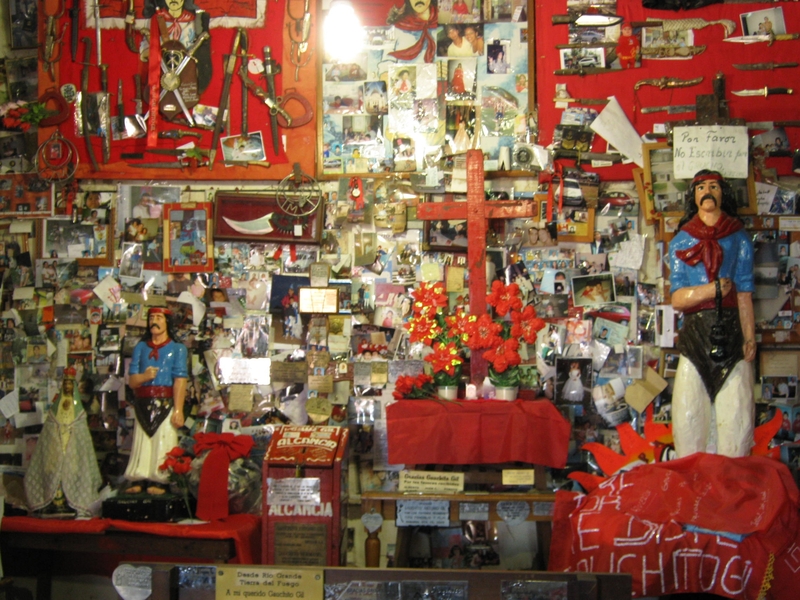 The shrine quickly grew, as well as Gauchito Gil’s renown as a saint who could intercede in matters of health, work and safe journeys. I arrive in Mercedes, in the center of Corrientes Province in northern Argentina. I ask the workers at the hostel how I might be able to arrive at the shrine of Gauchito Gil. Very simple, I am told. Just catch the green Línea 2 city bus at Plaza 25 de Mayo. As we approach the roadside shrine, red flags dance on the day’s light breeze. And the bus stops in from of the Santuario de Gauchito Gil. Several others and I debark. Other passengers hop off for a few minutes to make a quick request to the Gauchito. This is customary, I am told. All passing buses pause to allow people to visit this saint. 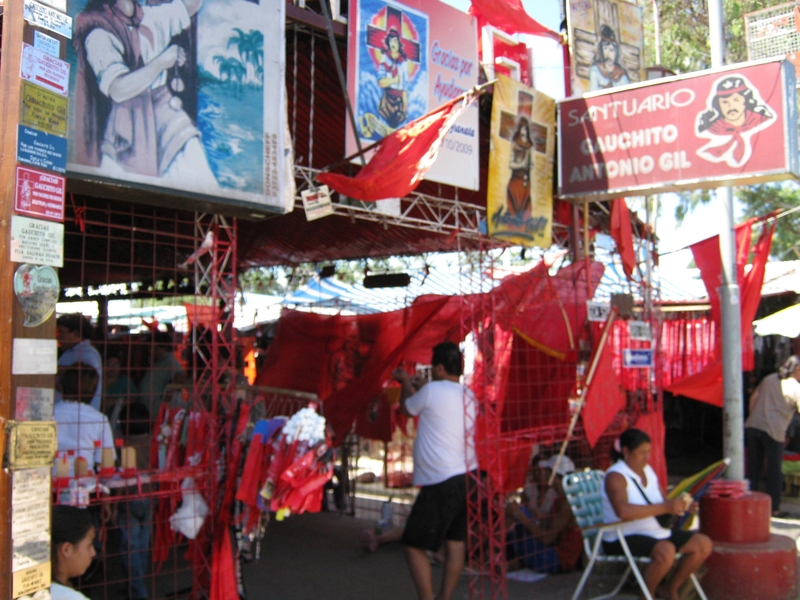 I stroll past dozens of stalls offer all sorts of wares for the faithful: statues and portraits to take home, scapulars and prayer cards to protect them on the road. Red streamers and flags to hang upon his massive statue in the center of the crowded compound and red candles to light the way of their requests to this popular saint. And I enter the tin-roofed chapels where smaller versions of Gauchito Gil stand, surrounded by candles with flames dancing in a barely perceptible breeze. The walls are covered with plaques, photos, handwritten notes – all thanking this renegade saint for his intersession. Modern Argentina isn’t a particularly religious country. What is it, then, that drives such fervor passed down through generations? What draws hundreds of pilgrims to come here every week? Why do so many thousands come and camp along this highway every 8 January, his feast day? But in the holiness of this space, I feel uncomfortable to ask probing questions about their faith to a saint the Catholic Church (let alone any other) would adopt as its own. I cross the highway to a roadside eatery to sit down to a typical Argentine parrillada (barbecue). A small band – guitar, violin and accordion – is playing chamamé music. This sad music is native to northern Corrientes Province. 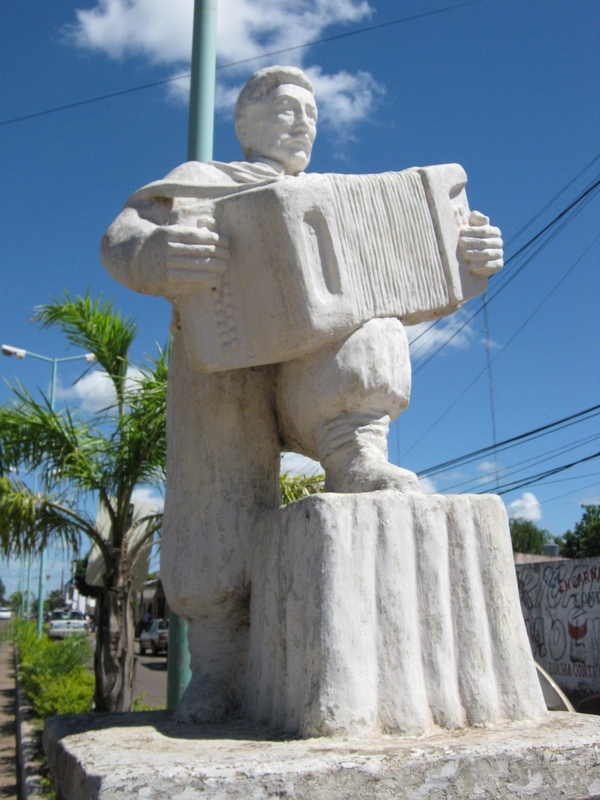 For a pair of days in early January, after Gauchito Gil’s feast Day, Pay Ubre hosts a chamamé music festival. Dozens of artists, like Nélida Zenón and Julián Zini, pay tribute to this saint. The capital, Corrientes city, has its Fiesta Nacional de Chamamé, also at the beginning of January. Other towns in northern Argentina, too, host chamamé festivals during the austral summer months. But the cradle of this song is M’burucuyá (155 kilometers / 93 miles southeast of Corrientes city). Here is the home where chamamé pioneer Eustaquio Miño once lived (Calle Cabral, east of Plaza Mitre) and the Museo de Chamamé (Calle Moreno, between Calle Cabral and Calle Astrada). The Festival del Auténtico Chamamé Tradicional (Authentic Traditional Chamamé Festival) occurs in February. Te pido humildemente se cumpla por tu intermedio ante Dios el milagro que te pido y te prometo que cumpliré mi promesa, y ante Dios te haré ver y te brindaré mi fiel agradecimiento y demonstración de fe en Dios y en vos, Gauchito Gil. Amén. I humbly ask you, through your intercession with God, the miracle that I request and I promise you that I shall fulfill my promise, and before God I shall make you seen and I shall grant you my faithful thanksgiving and demonstrate my faith in God and in you, Gauchito Gil. Amen. Before I leave Pay Ubre, I cross the road again and am guided by some force to those chapels. A sanctity flows through this space like incense, a sanctity unsanctified by any official church. This is a holiness that blossoms from the roots of the earth – and is common throughout Latin America. 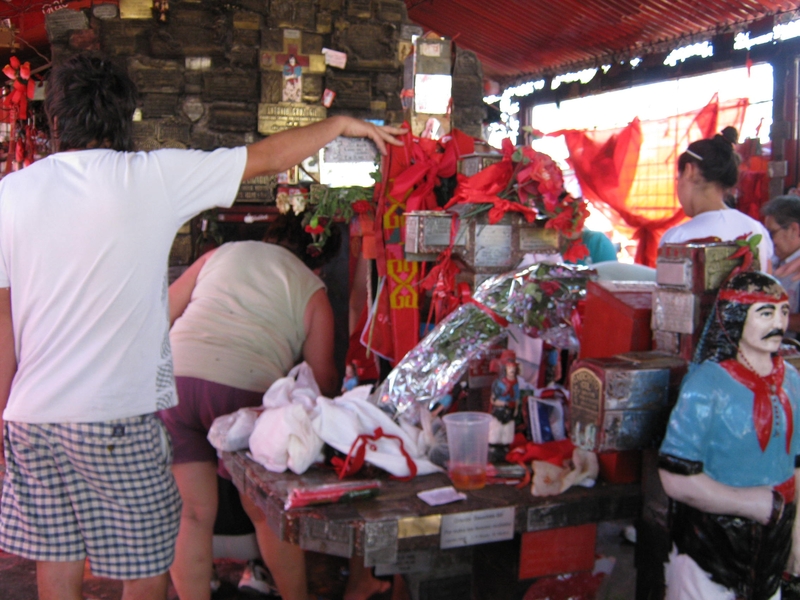 Gauchito Gil is found not only throughout his matria¸ but also in neighboring Paraguay, Uruguay and southern Brazil. Other countries have their santos populares. Venezuela has strong cults of popular saints like José Gregorio and María Lionza. And in cemeteries in both small towns and large cities throughout the Americas, you’ll see a tomb with flowers, candles and offerings to some local, home-grown santo. None sanctified by the Catholic Church – but rather sanctified by the pueblo. 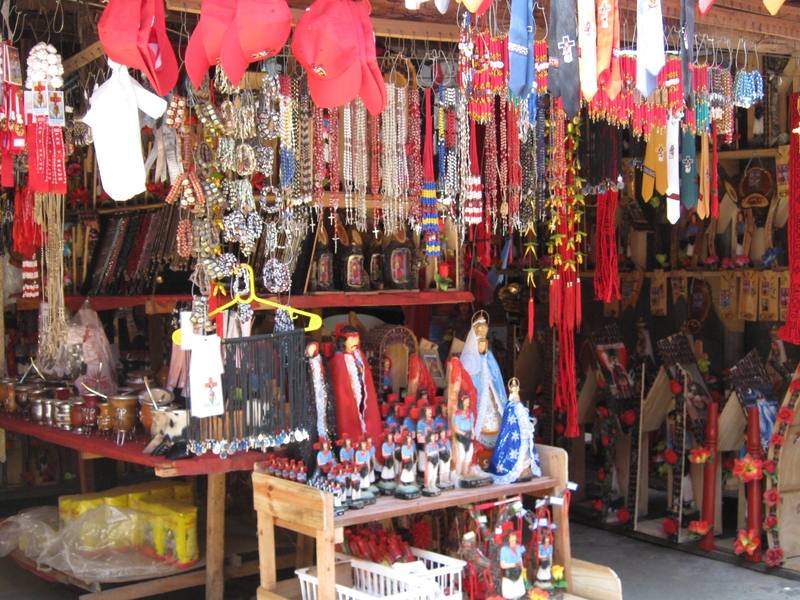 Before leaving to return to Mercedes, I stop at these stalls of Santuario de Gauchito Gil. I buy a few travel talismans for my coworkers in the guidebook office. 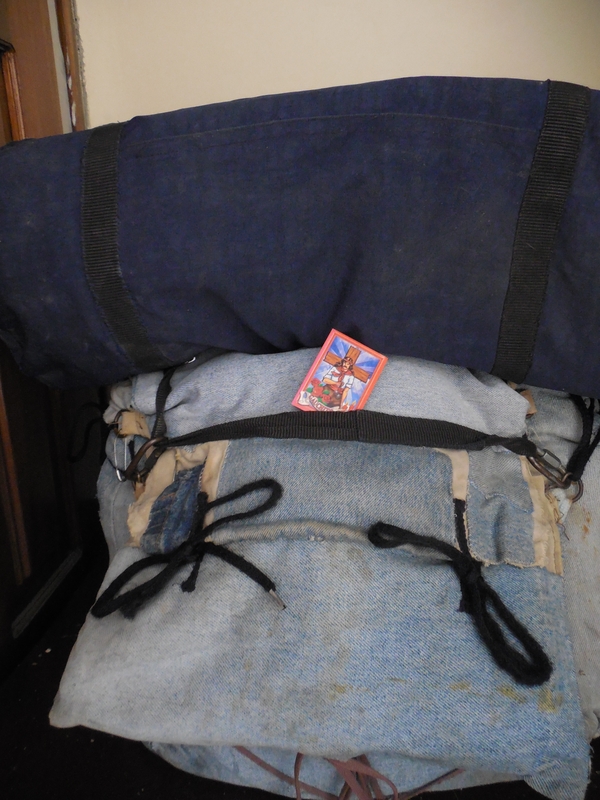 And, of course, I have mine which I keep with my faithful Rocinanate, ever ready to hit the open road …. This entry was posted in History, Holidays, Music, Popular culture, Religious traditions and tagged Argentina, Festivals, Religion, Venezuela. Bookmark the permalink. Lovely post. 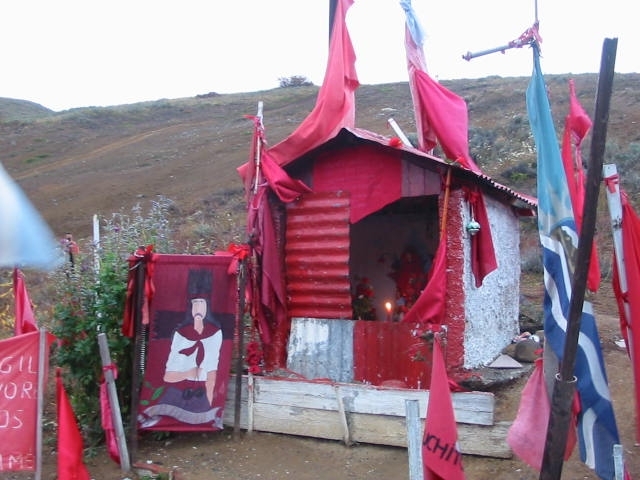 I didn’t notice shrines to Gauchito Gil last year, but I will be sure to pay attention this summer. Indeed — often things pass by without notice as we zoom down a highway. Do keep an eye out this summer and let us know what you find (and share a photo if you like)! And if you find yourself in northeastern Argentina, be sure to drop by the Santuario.